Find and book hotels in Udine. With location maps and guest reviews. Cividale del Friuli is a picturesque small town in the Friuli-Venezia Giulia region of north-eastern Italy. 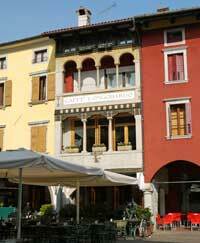 It makes a good stop on a tour of the area, and is an easy and enjoyable day out from the larger town of Udine. There are a few tourist sights, but most of all it is a place to spend several hours ambling, admiring the town and relaxing with local food and wine. Cividale is most famous for its Lombard history, and a past which was more exalted that its sleepy present-day atmosphere suggests. 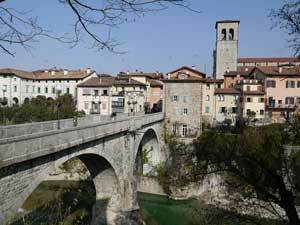 Cividale's official history begins on a precise date: 50BC, when the town was founded by Julius Caesar. Named Forum Julii, it later gave its name, with the pronunciation mangled, to the whole Friuli region. In the sixth century, when Lombard warriors headed south into Italy, they established one of their early capitals here at Cividale. Two hundred years later, the region's religious power, the Patriarch of Aquileia, transferred his patriarchate here. So for several centuries Cividale was the base for first temporal and then religious authority in the area, and the city's richest monuments and artefacts are a legacy of that era. Later, nearby Udine grew in importance and Cividale is now just a pleasant market town with a lovely setting and some fine sights to attract tourists. It is also the home of an annual arts festival called Mittelfest, which takes place in July. The heart of Cividale, and a good spot to begin exploring, is Piazza Paolo Diacono, named after an eighth century Lombard writer and historian. There's a small tourist information office here, offering maps, leaflets and organised guided tours on summer weekends. The centrepiece of the irregularly-shaped square is a fountain featuring Diana and four lion's heads. It's a picturesque spot, and there are several café-bars with outside tables where you can sit and soak up the agreeably small-town atmosphere. Leaving the square along pedestrianised Corso Mazzini, you pass the historic town hall and cathedral, facing each other on opposite sides of the street, and then descend to Cividale's most dramatic feature. This is a handsome fifteenth-century bridge crossing a shallow gorge, which at one time seemed so remarkable that it was named the Ponte del Diavolo, 'Devil's Bridge'. Crossing the bridge you'll come to a couple of good viewpoints, the further of which (around the church to your left) is equipped with benches. The panorama is wonderful, encompassing the picturesque town on top of stone cliffs, its array of church towers, the winding river Natisone below, and green hills rising to distant mountains, snow-capped for part of the year. This is a dramatic and elemental spot where it's easy to imagine long-ago folk believing in devils, spirits and gods of nature. A fanciful line of thought, but if you want to indulge it, return over the Ponte del Diavolo and procure a secret key to a mysterious shrine. Cividale's most unusual tourist sight is underground, and to enter it you must ask for the key at a bar on the main street just above the bridge, called Bar Ipogeo. (The tourist office should tell you if arrangements alter. Entrance is free, but staff appreciate a tip.) On a side street alongside the bar is an unimpressive door which you can open onto the Ipogeo Celtico. This is a series of rock chambers, or grottoes, carved close to the cliff face. No-one knows how old the caves are, who dug them, or why. As the name suggest, some think this is a pre-Roman Celtic site, perhaps intended for burials or rites. They could be Roman in date, or Lombard. A board outside expounds the theory that they could be Jewish ritual baths. 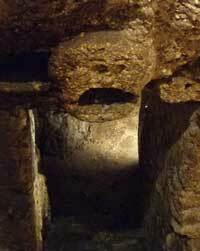 They could have been prisons, or more prosaically (my idea) they could simply be cellars. After switching on the lights, you descend a steep flight of stone steps down into a kind of stone hallway. Off this are several other rock-cut chambers, some containing what appear to be stone benches or basins. Most enigmatic of all are three roughly-hewn stone faces which leer down from the rocky walls. It's a very odd spot, mysterious and unmissable when you're in town. Continuing along Via Monastero Maggiore from the Ipogeo, you'll reach the Cividale's finest Lombard gem, the Tempietto Longobardo. This is a small eighth- or ninth-century Lombard chapel, now contained within the extensive buildings of a former convent, the Monastero di Santa Maria in Valle. An archway leads to the elegant church of San Giovanni Battista - you enter the main convent complex through a ticket office on the left. Inside, the green cloistered garden is an oasis of peace (if you don't mind the music piped through speakers camouflaged as stones). After rambling around the cloisters, visitors can step out onto a spectacular viewpoint, alongside a little garden where vines grow. Next comes the entrance to the Tempietto Lombardo. As the chapel is swallowed up by other buildings, you don't get much of an exterior view, so the simple, charming interior comes as a surprise. This is a rare and important surviving example of Lombard architecture, with later additions such as faded frescoes dating back to the fourteenth century. Parading on either side of an elaborately decorated arched window are six elegant female forms; saints or princesses, clad in flowing draperies. The stucco work decorating the chapel is beautiful and delicate; the building was damaged several times by earthquakes so one can only imagine how elaborate the orginal decorative scheme may have been. If you have the time, I'd suggest strolling on down the road alongside the ravine, where you'll see more pretty views and pass some charming historic buildings, through an old town gateway and out to where the atmosphere becomes more rural, and attractive buildings sit with gardens overlooking the river. There are a couple of spots along the road where you can descend to the cold-flowing river. Back in the centre of town - you can climb up from Via Monastero Maggiore, past an old well, to emerge alongside the cathedral - the three principal remaining sights are grouped close together. Cividale's Duomo has a long and chequered history - earthquakes and fires destroyed a succession of early buildings on the site; the current cathedral was begun in the fifteenth century and completed three centuries later, its final Renaissance-Gothic facade owing something to various architects including Pietro and Tullio Lombardo. Visitors should tiptoe up the steps to the altar, to admire a fine silver altarpiece, the Pala di Pellegrino. Dating to the twelfth century, this portrays the Patriarch along with saints paying homage to Jesus and Mary. Alongside the Duomo is a small but important museum, the Museo Cristiano. The main entrance is outside the church, to the right. 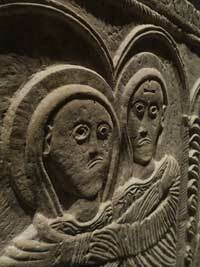 Two magnificent pieces of sculpture on display provide a window into the early Christian world. First is a beautifully carved block of Istrian stone, the Altar of Ratchis - Ratchis was an eight-century Lombard duke whose evident devotion led him to commission this altar, and to end his days as a monk. The altar has a compelling charm, with its naively-carved images of religous scenes, including the Adoration of the Magi, and hovering angels. In the same room is the Baptistery of Callisto, a large and elegant octagonal baptismal font, embellished with columns and carved decorations, some of them much older than the eighth-century baptistery . Upstairs you'll find two other museum rooms, containing art and other exhibits, including a painting of Christ and Mary Magdalen by Il Pordenone. On the other side of the Duomo, in the imposing Palazzo dei Provveditori Veneti, is the Museo Archeologico Nazionale, an archaeological museum dedicated to finds from within and around Cividale. English documentation and descriptions are hideously involved (who needs nine itineraries for viewing the same objects? ), but the museum is interesting to stroll around, even if you don't understand the Italian labels. On the ground floor are mosaics and relics of the Roman Forum Julii, followed by rooms displaying stone sculptures and monuments from different stages of the area's past. The museum's greatest treasures, though, are upstairs, where after some dramatic Roman bronze artworks the visitor reaches the rooms dedicated to the Lombard era. Most of the items on show are grave goods, including exquisite gold jewellery, gaming pieces, combs (used by both genders for their long Lombard hair, according to the Italian descriptions), religious tokens and glass beads (to ornament the "rude Lombard women," apparently). One tomb contained the skeleton of a rider buried underneath his horse, and you'll also see many decorative horse trappings in the glass cases of the museum. There is a great deal of beauty on display, which conveys the richness of Lombard society - practical, tough, rude riders from the north they may have been, but these bright ornaments, combined with the Tempietto Lombardo, offer a more delicate picture. The Lombard goldsmiths copied Byzantine coins, and used them as jewellery strung on necklaces, while the bright multi-coloured bead necklaces are very different from anything you'll see in the average museum in Italy. After these principal sights, the main pleasure of Cividale is simply strolling around the compact centre with its charming medieval atmosphere. Walking up the street opposite the Duomo will bring you to Foro Giulio Cesare, a wide open piazza dominated by a monument to Adelaide Ristori, a Cividale actress and patriot at the time of the Risorgimento. From this square you can loop back around to the right through some of Cividale's most quaint little lanes, past several tempting food shops and places to eat. The Udine-Cividale railway, the Tempietto Lombardo and the Museo Cristiano are included in the FVG Card, a tourist card which can be good value if you're touring the region. Since the museums have varying opening hours, generally closing for lunchtime, check the latest opening times at a tourist office in the region or online in advance, where you'll also find the prices of tickets, entitlements to reduced/free admission and details of combined tickets. In the links panel on the right, see the Comune di Cividale website and look under Turismo/Orari di apertura. If you are keen on the Lombard element of Italian history, another important collection can be seen in the Museo dell'Alto Medioevo in Rome. 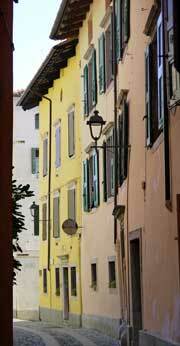 Cividale is a small town but it still offers some choice to hungry visitors. There are places to eat and drink in each of the town's main squares, and a few more scattered around the narrow lanes. I ate at Ristorante Al Monastero, a wood-panelled ceiling-frescoed restaurant which managed to be both refined and homely. (Via Adelaide Ristori 9; 3 courses & wine €23). The restaurant serves local wine and food specialities, such as cialcions, a kind of stuffed pancake-like pasta. The white chocolate and strawberry dessert will live on in my memory for some time. The easiest way to visit Cividale del Friuli is as a day trip from Udine. A private railway line connects Udine railway station with Cividale in 20 minutes. The rail company is called the Ferrovie Udine Cividale, and its modern trains, with large windows for admiring the landscape, are a comfortable and scenic way to travel. Trains operate hourly, with extra half-hourly services at peak times. The station in Cividale is a short walk – around ten minutes – from the centre of town. Leaving the station, walk up to the main road on the right, Viale Liberta. Cross this and walk left, passing one junction and a park, until you reach the turning with Via Monsignor Liva, on your right. A short distance up this street, cross over and take Via Manzoni, which leads into the pedestrianised lanes of the centre. Turn left on reaching Via Ristori, and you'll come to Piazza Paolo Diacono. There's a small but tempting choice of hotels and B&Bs in Cividale if you want to stay overnight in the town, or perhaps base yourself here for a few days. I stayed in the nearby city of Udine, at a friendly three-star hotel by the railway station: Hotel Principe.